The Pound is showing bullish potential when paired with the Swiss Franc. It has formed a bullish chart set-up called a pivot swing on the monthly chart, which suggests the potential for a rotation higher, subject, of course, to confirmation from a break above a key confirmation level. Above: Studies of Effective Exchange Rate levels tell us where a currency is currently valued vs. long-term trends. This is mainly because of the uncertainty surrounding Brexit and the risk of a hard Brexit weighing on demand for the currency. Remove the uncertainty and Sterling is likely to rally fairly strongly. The Swiss Franc meanwhile is one of the most overvalued. Whilst this has been the case for sometimes and could continue to be so, it suggests an upside bias to GBP/CHF as the Pound drifts up towards its fair-value and the Franc drifts down. Even if the Franc holds onto its value and only the Pound rises as would be the case if the EU and UK agreed on a deal the pair would still see gains. If a Brexit deal is agreed, the Franc is likely to fall at the same time as the Pound rises because it is a safe-haven currency. A Brexit agreement will reduce risk aversion, if anything, resulting in less safe-haven flows to Switzerland. Add to that the bullish swing noted on the monthly chart and you have a compelling set-up begging to give the green-light to a British Pound rally. The pivotal month for GBP/CHF was in September when it hit a new low and then rotated higher in October. Despite pulling back marginally the swing has already signalled the birth of a new uptrend. The bull signal would gain re-confirmation from a break above the 1.3116 October highs. A possible initial upside target is supplied by the 50-month moving average (MA) at 1.3570 where risks increase that the exchange rate could rotate back down again. 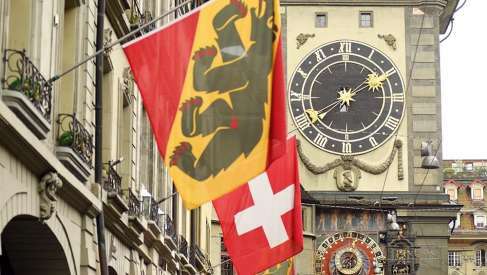 Pound outlook vs. Swiss Franc: Analysis suggests the Pound can go higher near-term but gains would likely be limited to the next week or two. Concerning the outlook for GBP/CHF, we are overall bearish from a technical perspective in the short-term conditional upon a break below 1.3000 initially, but then also 1.2850 after. The Pound-to-Franc rate was trading around 1.3138 Thursday after after having fallen 1.5% in the week before. It is slightly up this week after Brexit risks eased due to the increasing chances of a longer delay to the Brexit process, an eventual customs union or even a second referendum. The USD/CHF rate rebounded from earlier losses during the latter half of this week, posing the question of whether a more sustained recovery this month's losses could be on the horizon, although at least one analyst says it won't be long before the exchange rate resumes its earlier decline.